A member of the U.S. Olympic team in the women’s 4 x 400-meter relay pool has tested positive for “the likely presence of an anabolic steroid,” per the Chicago Tribune, and has withdrawn from the team. "I have been informed by the U.S. Anti-Doping Agency that a sample I gave at the U.S. Olympic Trials contains an elevated testosterone/epitestosterone level,” 34-year-old Debbie Dunn said in her statement to the Tribune, which reported the positive result. “While I work with USADA to resolve this matter, I am withdrawing from my relay pool position for the 2012 Olympic Games. The 2010 indoor world champion in the 400 meters, Dunn finished fourth at Trials in a time of 50.78, missing out on one of the three Olympic spots in the event by .35 seconds. But she was poised to go to London as part of the U.S relay pool in an event in which the Americans have won the gold medal at every Olympics since 1992, and will be heavily favored to do so again. USADA chief executive Travis Tygart told the Tribune that Dunn’s sample had also tested positive for an adverse carbon isotope ratio, another indicator of “exogenous testosterone.” To test positive, the “T/E” ratio must exceed 4-to-1. The ratio is typically less than 1-to-1 in women. 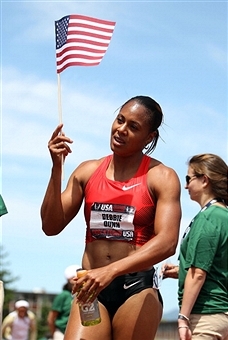 Sports Illustrated’s Tim Layden pointed out that Dunn’s personal-best time had been set as a 32-year-old, and that she had gotten surprisingly faster since turning 30, factors that would be viewed by many as a potential red flag. A U.S. Track and Field spokesperson told the Tribune that no decision has yet been made on whether Dunn’s vacant spot on the team would be filled by another athlete. The U.S. relay pool already included two other 400-meter competitors in Trials, fifth-place and sixth-place finishers Diamond Dixon and Keshia Baker. Natasha Hastings finished seventh and would hypothetically occupy Dunn’s place if USATF elects to simply take the next woman in line.